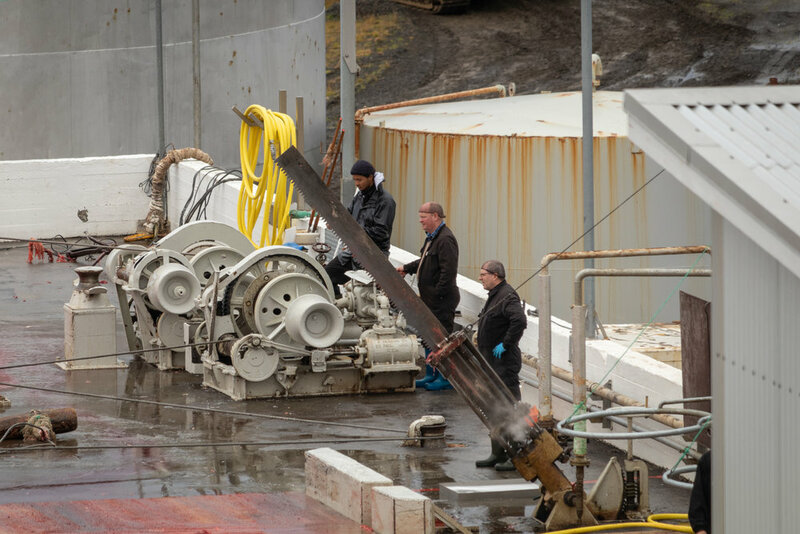 Warning: This blog post contains graphic images of whales being butchered at a whaling station. If you do not want to see this, please do not read on. In my previous blog post here I wrote about my experiences visiting the whaling station in Hvalfjörður. In reality, on that occasion, I only saw the clean up part of the whaling process and did not see any newly returned whales being butchered. None the less it was an extremely sad experience and I didn't think it would be possible to see anything worse than this. I could not have been more wrong. Earlier this week I was notified that one of the boats had returned after a successful hunt. I immediately got into my car and drove for an hour to the station. I again parked at the viewing spot just above the station. There was another car there along with two guys from Sea Shepherd who were documenting what was happening. As I opened the car door I was hit by the worst smell I have ever come across. A mix of iron, chemicals, cooked meat and decay is about the best I can do in describing it. I imagine this is what people are describing when they talk about the smell of death. I almost retched. Phil, one of the Sea Shepherd guys, I think could see my reaction and it was all I could do to not breath in as we made our introductions. His colleague Sam was along the fence where the smell was apparently worse (I can confirm that was somehow unbelievably the case). 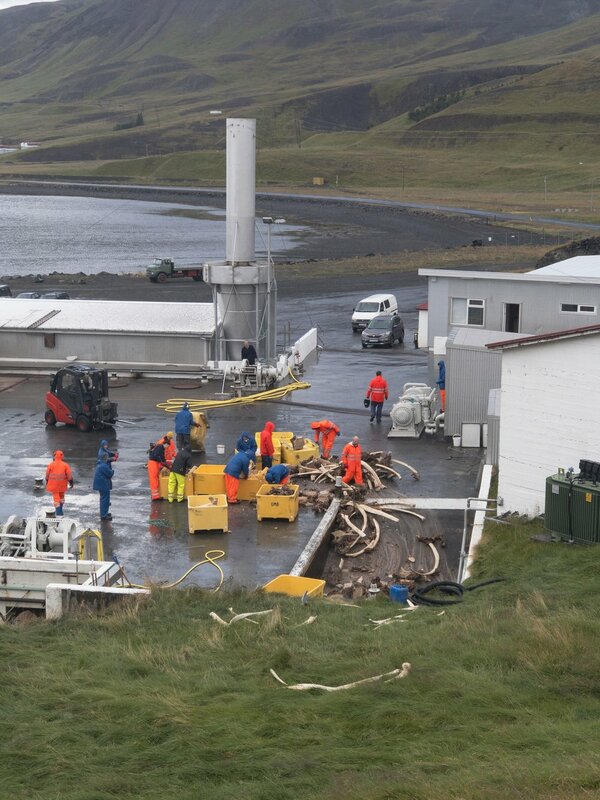 Below were the remains of the first of two whales that had been brought back. This makes up the first set of images. Over the next 4-5 hours I witnessed them completed the butchering of this whale and the subsequent butchering of the second whale. All the while music was blaring out - Paul Simon's "You Can Call Me Al" will never sound the same. A vet (in black) checks to see if the female was pregnant. She wasn't this time but there have been 15 pregnant females killed this year so far. The vet will often stamp on the uterus to check. If there is a baby it will be rushed away from the cameras - surprising considering that they claim not to be ashamed of what they are doing. They have also pretended that some females have been pregnant as a cruel joke to those documenting this. A worker stands on top to separate the spine. Another worker walks to attach the waste to a winch so it can be dragged away. A worker checking his watch. It takes surprisingly little time to take apart a whale that may weigh 80 tonnes. This pit contains the upper portion of a previous whale's head. You can clearly see her eye looking up. This effected me deeply. The pit contains some hot liquid with possibly some chemical. You will see in my previous post that the final result is what looks like cooked meat that can be stripped off the bone easily. The tail of the whale now visible as she's been flipped over. Whale meat visible in the background. As they come to finish processing they flip the whale onto it's side. The sound it makes is awful. The whole experience is a sensory overload when combined with the sight and smells emanating from the station. The workers took a lunch break at this point. Whale 117 waits on the slipway waiting to be processed, half in the water. The harpoon hole clearly visible behind its fin. The upper part of the head from whale 116 upturned, her closed eye visible through the steam. This was one of the hardest parts for me to see. A clearer view of the number 116 carved into the bone. This is perhaps done for record purposes. Now it's the turn of whale 117. A winch is attached to the tail fin and she is hauled up onto the whaling station. The winch pulling the tail fin, vets looking on, waiting to take their measurements. Whale 117 hauled into position for processing. She was an average sized fin whale. You can still see she was very big. 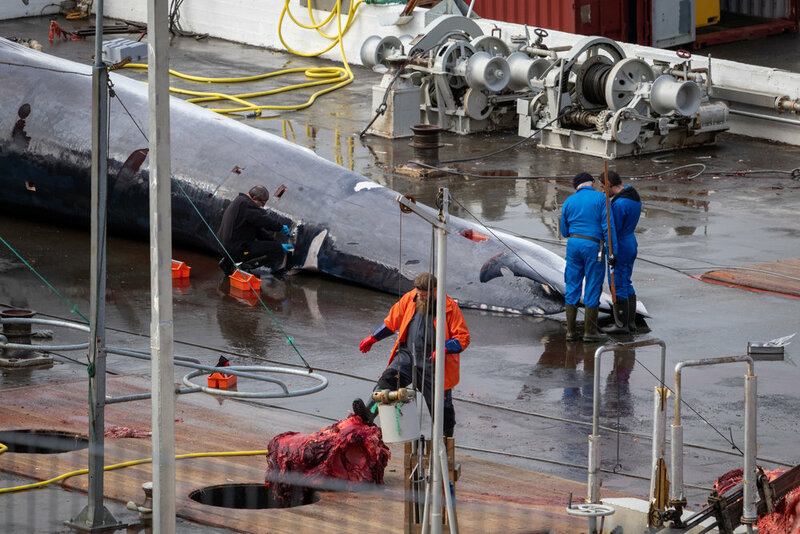 The vets take size measurements whilst a worker goes about immediately removing the rope that attached the whale to the side of the boat. A close up of the harpoon wound reveals what appears to be the tip sticking out of the side (the hooked bit towards the top of the image) whilst the base is embedded just behind the fin. This suggests the harpoon has gone all the way through. We have no way of knowing how this affected the speed of her death but it is awful none the less. The pneumatic saw in action cutting the spine of whale 116 into pieces. The power tool of nightmares. Throughout the day the workers would spend time laughing and joking, sometimes waving up at us watching them. They clearly enjoy what they are doing. The vet cuts into the whale to take samples for testing. In 2015 Japan rejected the meat for being too contaminated. It begs the question "what is the point then?" Whilst the vets run their checks, another worker uses his boots to kick parts into a hole. I think this is perhaps the most upsetting aspect of it all. There is absolutely no care or respect given to the creatures. They are truly just considered as pieces of meat. An overview of the station. There are the parts of at least 3 different whales visible here. Work begins. The first cuts into whale 117 cause blood to pour out of her air hole. Workers climb onto her to start dividing her up. The worker to the right sharpens his blade. Further incisions prepare the whale to be skinned. A cable and winch are attached to the skin which is then cut and pulled away from the body. It doesn't take long for the skin to be removed, a matter of seconds. In the mean time, workers continue to dump parts into the holes. The worker on the right using a chainsaw to cut up bone. After a couple of minutes, the skin is removed. 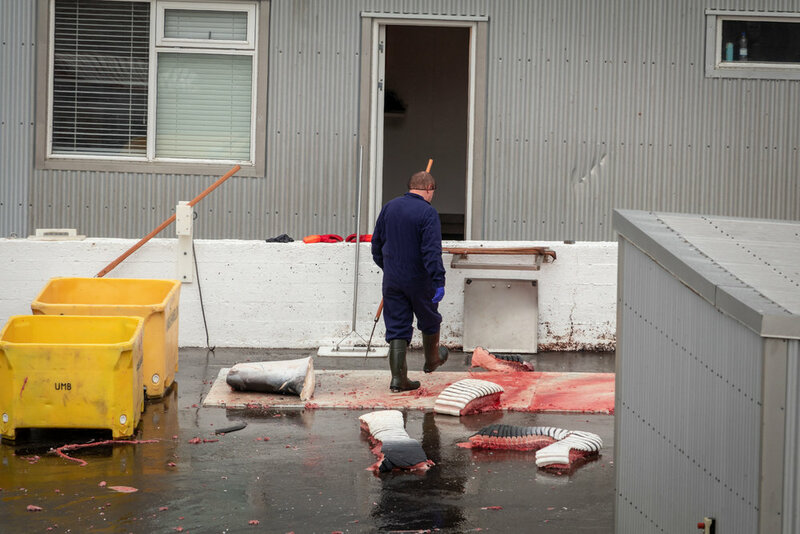 The vet is taking measurements, perhaps the temperature of the whale, whilst a worker sharpens his blade next to him, ready to start taking the meat. As the meat was cut from the back, the smell returned worse than ever. It was at this point that a winch and cable were attached to the lower jaw and it was literally ripped away. After some resistance, the jaw gives way and is pulled away to be cut up into pieces. On a day of awful images, this is up there as one of the worst. Time to remove the front of the whale with the intestines, stomach and uterus all being cut free. A winch and cable again being used to pull away the waste. The vet is standing ready to check if she was a pregnant female again. Thankfully she wasn't. An incision causes water to flood out of the whale to much hilarity. A worker films everything for reasons unknown. We had all had enough by this point and decided to call it a day. After leaving I headed to Akranes to try and clear my head. I was in shock at what I had seen over the previous 5 hours. I headed to the lighthouse thinking I may be able to see the other boat, Hvalur 8, return and warn the guys. Instead as I arrived at the lighthouse I saw Hvalur 9 already leaving the fjord to hunt again. She would return around 36 hours later with another 2 fin whales. I was just snapping images of Hvalur 9 sailing out as a record and not paying too much attention. When I got home I realised that the boat had been photo-bombed by what looked like a minke whale. The irony of this was not lost on me but it was a bright point on an otherwise distressing experience. After around 3 hours at Akranes, and no sign of Hvalur 8 returning, I left and headed home. Hvalur 8 would in fact stay out for an extraordinarily long time on the trip, only returning after more than 50 hours. Let's hope it is getting harder for the whalers to find the whales. If you have reached this far, thank you for taking the time to go through these images. If this has affected you please do leave a comment below and do consider taking the time to write to the Icelandic government if you can. If you can't, perhaps I can ask that this post is shared. I can only do so much to raise awareness of this but I know that it does make a difference the more people that see this. I will continue to follow the remainder of the hunting season and keep you updated of any new developments. I have decided to write a post about my recent experience where I witnessed part of the whaling process first hand. I will provide some background and information on the subject along with some photos that I took but I first want to be clear on my own personal views on whaling: I am against it in any form. I believe that it is unnecessary, stemming from a time of poverty when food was in short supply and whales provided a lot of meat. The meat from the Fin whale hunt (which is the main focus of this post) is not consumed domestically and the company which hunts claims it doesn't even make a profit from sending it to Japan (where it was rejected in 2015 for being contaminated). I believe it is cruel. Harpooning a whale is not a quick death and scientific progress in recent decades shows whales to be extremely intelligent creatures. I believe that a certain level of humanity should be given to these animals but they are still hunted in the same way as they always have been. I think it is hypocritical of Iceland, or any government, to authorise whaling whilst at the same time promoting tourism to Iceland, in part by advertising the opportunity for tourists to experience a whale watching tour. It's even worse when you hear that these whale watching boats are actually sometimes passing by the whale hunting boats. How this contradiction can even exist is beyond me. 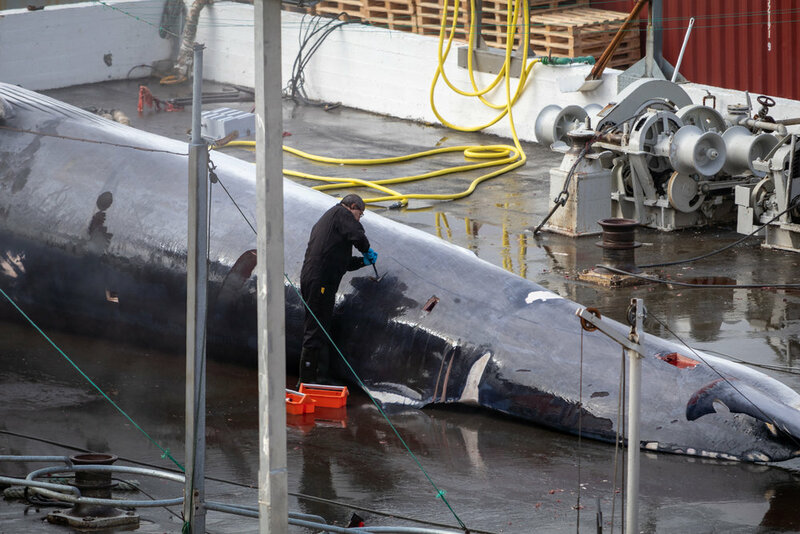 Earlier this week I saw another article posted about Hvalur, the last whaling company in Iceland to hunt the endangered Fin whale. 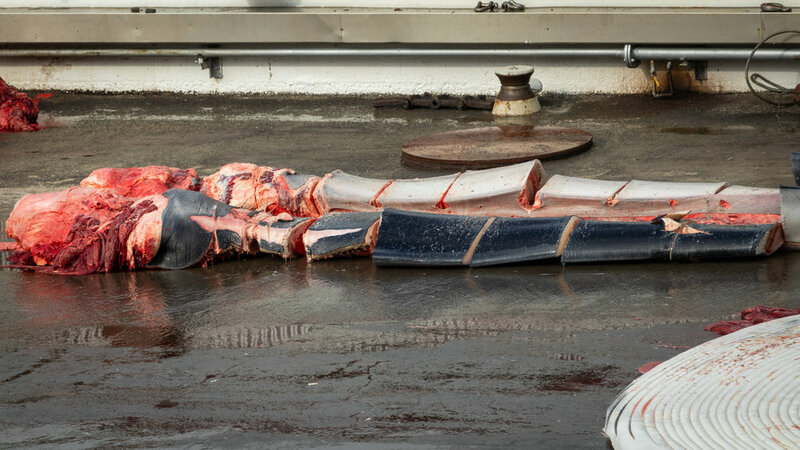 The article reported how the company had caught and landed a second Blue/Fin hybrid whale. The article is here. If true, this would be the second time the company had caught one of these whales this year. 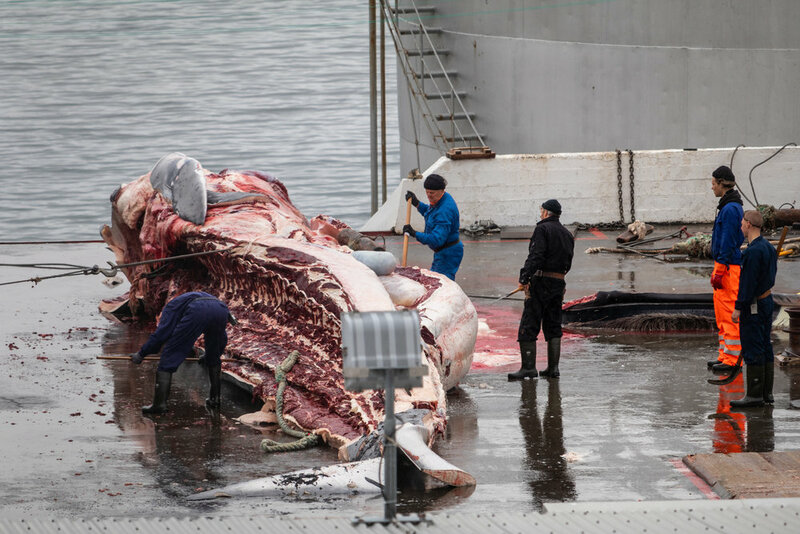 Icelandic law states this is legal, although the hunting of Blue whales is forbidden. Throughout this summer, Hvalur has been out hunting whales about 150 nautical miles off the West coast of Iceland. So far to date (Thursday August 30th 2018) they have hunted 109 Fin whales, 14 of them pregnant females, and 2 hybrid Blue/Fin whales. They have 2 boats that travel out on hunting trips for between 24 and 36 hours and in the last week they have been out almost 24/7 in the better weather. Each boat can catch 2 whales per trip. 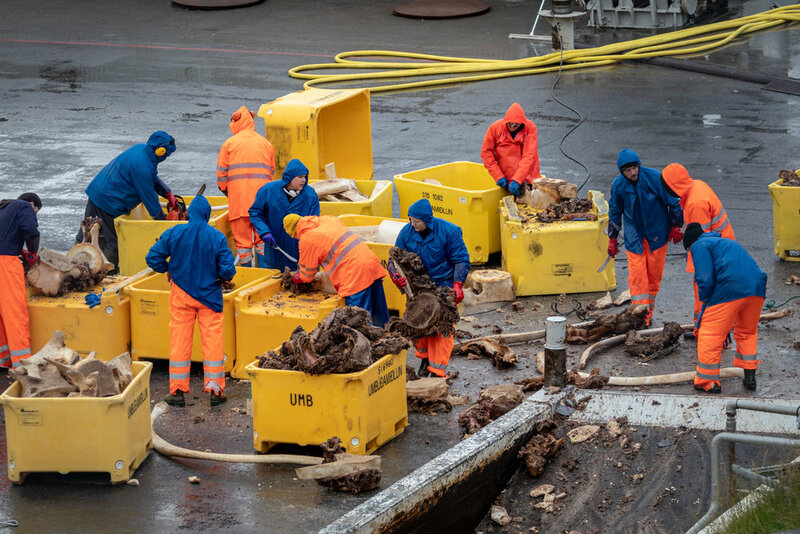 The whales are harpooned, killed and tied to the side of the ships and brought back to the whaling station in Hvalfjörður around 70km outside of Reykjavík. Here they are processed into meat and waste, the meat being sent allegedly for consumption in Japan. The last time the company hunted in 2015, the meat was sent to Japan only to be rejected by the authorities for being too contaminated with pollutants. Apparently the owner of the company, Kristján Loftsson, has stated that this "red tape" is the reason he did not hunt again in 2016-2017. He has also defended the practice of hunting pregnant females by saying that he firstly cannot tell if they are pregnant and that there would be something seriously wrong anyway if they were not catching some pregnant whales. 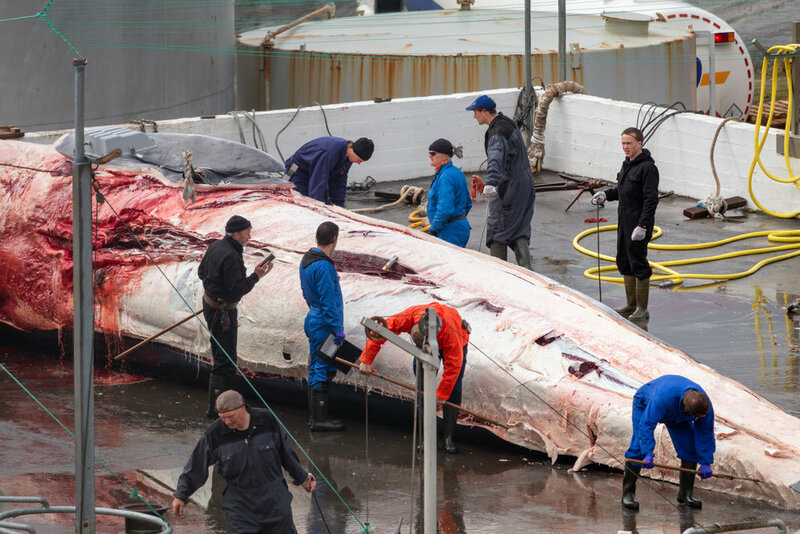 There was a very interesting article about him recently in the New York Times which I encourage you to read here: Meet Iceland’s Whaling Magnate. He Makes No Apologies. After the recent article I wanted to go and see if I could see anything at the whaling station for myself. Below is a map of the location of the station. It is around a 1 hour drive from Reykjavík - you take a right turn before the tunnel under the fjord and follow the road all the way around beautiful Hvalfjörður. I wasn't sure what to expect. As I came to where the station is I saw what seemed to be an area for parking outside the fence, just above it. Having missed it initially, I turned around and parked up next to another car (the occupant is someone I'll come back to). There is a fence with warnings along it but the view down to the station is unrestricted. I had an initial walk along the fence to where I could see lots of plastic boxes clearly filled with various whale parts. I would later learn that these were just the waste products. As I walked further I could then see a group of men working next to some sort of steaming pit. 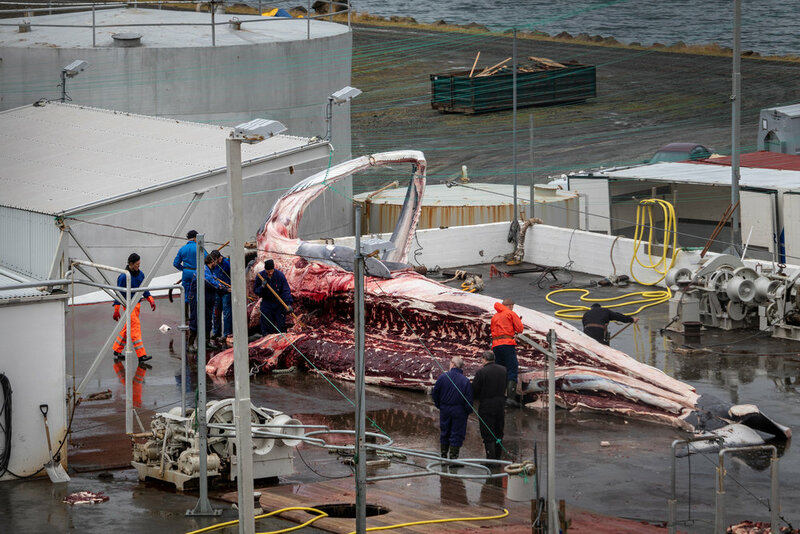 I slowly realised that they were finished up the processing of the last whale to be caught. The pit perhaps had boiling water or some sort of acid to strip the remaining bones. Some of the group were above cutting the bones clean with knives, others were dragging bits around. The thing that struck me most was the lack of any care in what they were doing. They were hacking away at what was left, dragging up bits of carcass, laughing and joking. It shocked me if I'm honest. I found it surreal, especially with the loudspeakers in the station blaring out Eminem's "The Way I Am". I won't be able to hear that song again without it reminding me of this. I spent a good 10 minutes just observing and took a couple of iPhone snaps before deciding I would get my DSLR from the car to try and document something. As I passed the other vehicle I waved at the occupant who had been sitting there. I wasn't sure if she if she was part of the whaling company but it turned out she was with the Sea Shepherd UK organisation. She had been waiting to see if I was from the whaling company too! I grabbed my camera and walked back with Brigitte who was able to provide me with information on what we were seeing. On arriving back at the viewing spot (the worst one in Iceland?) we could see some new activity. The boxes of whale "waste" were now being lifted by a forklift and dumped into two round holes. There were dozens of boxes which must have contained tonnes of this. Then the forklift started to bring over boxes with whale bones and ribs in and began dumping them into the holes too. Whilst all this was going on the crew by the pit were waving and laughing up at us. Brigitte informed me that this was normal and they were pretty jovial. They seemed to think it was amusing that we were up there but left us to it. Well almost. A van did come up from the compound and parked up behind our vehicles for about 5 minutes, perhaps to record our vehicle information. If it was an attempt to intimidate it didn't really work and I don't think it was. We weren't doing any harm. The pit crew, as I will now call them, had started up a chainsaw and were now cutting the massive spine bones down into smaller chunks. Some of these were put into containers with lids and sent to a separate storage pile, for reasons we don't know. Some of the other pieces were carried, with great hilarity by some of the crew who were pretending to be strongmen I think, to the holes where they were then dumped. One of the crew then thought it would be fun to do a handstand on one of the closed boxes which I unfortunately was unable to photograph in time. It turns out I was witnessing the final clean up part of a fast moving and efficient operation. It had taken them only a matter of hours to drag the dead whale up to the processing area and in essence make it disappear. The team finished off everything by hosing the area down. And that was it! An 80 tonne whale taken apart in the space of a few hours. 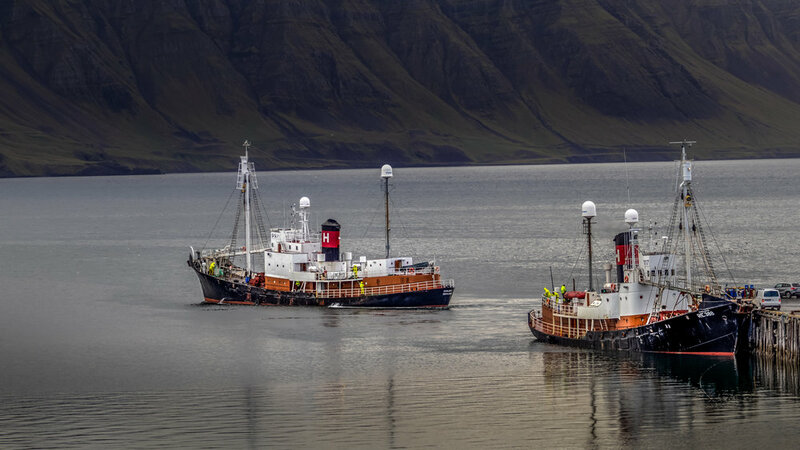 Off to our left were the two remaining whaling boats in the fleet named Hvalur 8 and 9 by the Sea Shepherd group. 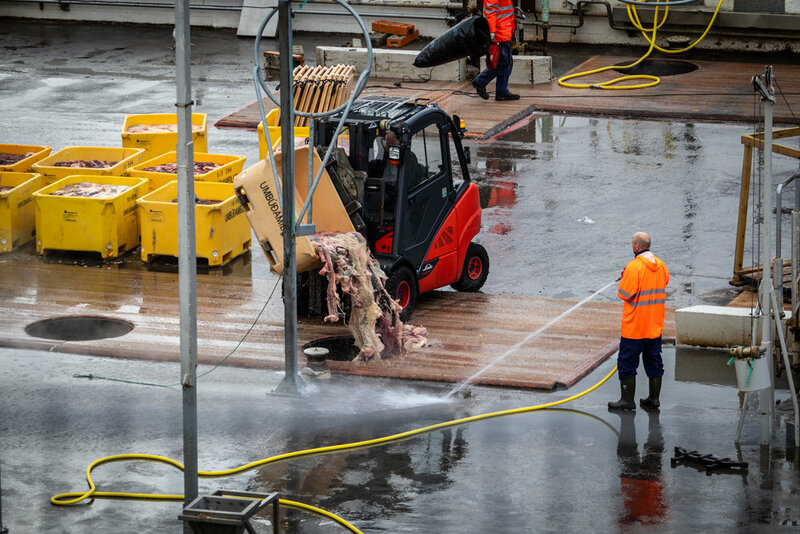 As the clean up was finishing, they both made ready and set off to sea, starting the process all over again. Brigitte went off to record this for Sea Shepherd causing another round of laughter from below. We watched the boats sail painfully slowly out into the fjord. Brigitte says that Sea Shepherd UK have had a group of volunteers in Iceland over the summer observing what has been going on. They would now watch for the return of the boats in around 24-36 hours, waiting for them to appear at the mouth of the fjord. They would then have about an hour to get back to the whaling station to document them bringing the whales in. After about an hour or so watching, it was time for me to leave. Brigitte and I agreed to remain in contact as I wanted to go back to see them bring the whales to shore. In fact it would be around 30 hours later, at about 1 o'clock this morning before they would return, again with 4 more Fin whales. Unfortunately I was not able to go back today and by the time I would have arrived it sounds like they were already finishing up anyway. I fully intend to be there for one of the next landings, if they manage to do any more. Thankfully the weather looks poor for the coming days so I am hoping this delays their attempts to venture out significantly, perhaps until the season ends in a couple of weeks. We can only hope. This has been a longer post than I had intended and light on images until the end. However, seeing only a part of the whaling process in person has effected me more than I thought it would. It is painful to watch videos of harpooning on YouTube or footage of grieving whales on something like BBC's Blue Planet. It's another experience entirely to see first hand a group of men taking a whale to pieces over the course of a few hours. For me the saddest part was seeing the boats departing. Their painfully slow progress out of the fjord was almost like torture. More so knowing that out at sea 4 innocent whales were happily feeding, oblivious to what was about to creep up and kill them the next day. To hear that 4 more were indeed caught made this moment all the more painful. As I drove home that evening under a beautiful sunset, I actually passed the boats again at the mouth of the fjord sailing out to hunt. Off to their left were 2 large cruise ships full of tourists undoubtedly wanting to come and experience all the amazing things Iceland has to offer. Unfortunately, they were unaware that just across the water from them were 2 boats heading off to do some of the very worst things Iceland is known for. I will be heading back to Hvalfjörður to try and document whales being brought to shore. I actually hope that they are unable to hunt any more this season so I don't have to. You can also stay updated via their Facebook page where they have been going live with updates on the whaling regularly. Be warned, the footage is pretty distressing. 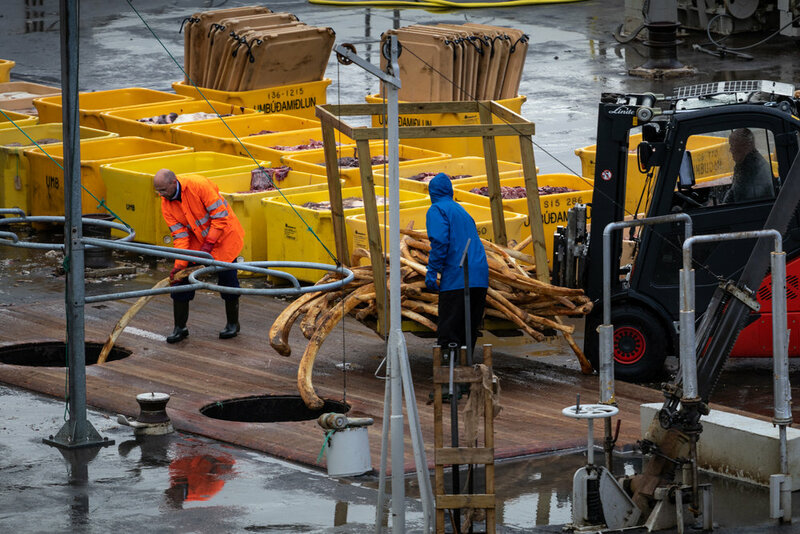 "Spineless" - pieces of whale spine are loaded into boxes. I'm a big fan of trying new things in photography and was kindly given an infrared camera recently that wasn't being used by a friend. I'll be honest, I haven't really felt a pull towards trying infrared photography and I wasn't sure what use I would have for it considering my focus has been on film photography recently. That said the camera was gratefully received a couple of weeks ago and I promised to give it a try. The camera is a Canon G10 with a 720nm conversion. This is a point and shoot camera from 2009 with a 14.7MP sensor. It's a great little camera and I particularly like the analog controls and dials on the body, something sadly missing from most of the current modern cameras (Fuji aside). Funnily enough it was my complaints about the appalling summer weather we have been having (the worst in 100 years) that led to the camera being offered to me i.e. perhaps I could get some interesting cloud details in IR seeing as cloud is all we are getting at the moment! Anyway, the first venture out was on a dog walk in the local neighbourhood. Being a point and shoot, it's easy to carry and hand hold so I slung it around my neck and off we went. I really like IR reflections! Did I mention IR seems to be good for reflections? I took a few snaps and on getting home loaded them up in Lightroom. Initial impressions were that the images were extremely different and captured some unusual details. Clouds are certainly rendered dramatically. Greenery is rendered almost snow white, which I already knew, but when contrasted against backgrounds (sky, water, walls) it stood out in a very unique way. Editing wise I did a cursory read of a couple of posts relating to infrared processing and played with both black and white and colour images. Both appeal but I can see great potential for unique black and white work moving forward. One note I want to make at this point is that I have purposely not spent hours reading and researching how to post process infrared images (and it may well show). It's not often we are able to approach something in photography without having a preconceived idea of how things should be done or how things should look. I therefore deliberately wanted to minimise the influence of other infrared photographers, aside from understanding the very basics, in order to create my own images and style. We shall see whether this works! A couple of days later we took a trip out to Nesjavellir and the area around Þingvellir with our dogs. I took all my normal photography equipment but only ended up reaching for and using the Canon G10. I was pretty pleased with the results. It was another grey day but I was able to find a few different subjects which I thought would work well and I enjoyed playing around with post processing in black and white and in colour depending on the scene. When it is possible to get some colour from the sky I can see the potential IR offers in brighter conditions (when it is more traditionally used). That said, in grey conditions I really like that it can create real drama from the clouds. I even had a play with stitching a panorama together as seen in the beach image above. One thing I did notice is that there is more noise in the images than I am used to. This despite keeping the ISO at a very low 80. I imagine this is due to the nearly 10 year old sensor technology and it isn't a huge issue. In fact it gave me an idea to experiment with stacking and averaging images of the same scene in the future to reduce the noise and possibly even create larger super resolution images (similar to how pixel shift works in modern cameras). I ventured out again last week to explore a road that has been closed all winter and which only just reopened. This wasn't intended to be a photography trip, more of a scouting mission to determine if the road was passable. As such I grabbed the little G10 and headed out. Here are some images from the journey. I again found myself really enjoying using the G10. Aside from infrared still being a novelty for me, having a point and shoot, and therefore a portable little camera, was also extremely helpful. I forget how limiting it can be sometimes to heft around a DSLR or film camera with a set of lenses and associated accessories. Being able to grab the camera, flick it on and grab an image was refreshing. These images show me the potential of infrared when there is good light. The landscape can be lit up with what almost appear to be floodlights. Combined with a dramatic sky, I can see myself really enjoying this type of dramatic IR photography in the future. I only wish that Mamma Sheep had looked up when the light was on the hill but unfortunately she didn't. So this has been my first foray into infrared photography and I'm by no means an expert or producing amazing work. I am enjoying it immensely though and I think this is the most important thing. It opens up some new creative opportunities for me with the landscapes here and I definitely see myself adding it to my portfolio as my skills and understanding improve. I am very grateful to Richard Stern in the US for sending me his camera and encouraging me to give it a try - thank you Richard! In Part 1 of my article on Icelandic Seascape Photography I described a couple of my favourite locations for seascape photography. Luckily two of them are about a 30-40 minute drive from home for me. This week I go a little further afield to describe 3 other places I have enjoyed visiting around the coast. This beach is located just a little drive further along from Londrangur in my last post. Following Route 574 after Londrangur you can take a little detour first to visit the Malarrif Lighthouse and visitors centre there. A good place for a comfort break too. Once back on Route 574 you continue on for a short while before reaching a turning onto Route 572 marked as "Djúpalón 2". I point this out because the beach itself isn't signposted - the 2 here signifies the 2km drive to the car park. The road is paved and in good condition although it is narrow with a lot of blind corners. At the car park there is a small toilet but this is closed in the winter months. There are a few path options to choose from taking you to different points. If you have time it's worth exploring them but if you want to visit the beach take the path down into the little canyon. In winter you definitely need ice grips on your boots - I speak from experience here! Along this path you'll walk between some impressive lava formations including a hole in the rocks where I'm sure some creative framing fun could be had (it was too icy and cold on my visits to scramble about). Following the path to the beach you will come across 4 different sized stones, if they are not covered by snow! These were a lifting game by fisherman with them competing to see which of the heaviest stones they could lift. Give it a go but be careful! You then walk up a slight rise where you'll see the wreckage of the British Trawler Epine strewn about. I think there is potential for some interesting detailed images of these parts and intend to return when there is less snow to explore more. Over the rise is the beach itself with it's famous smooth black pearl pebbles. Depending on the conditions, the sea here provides opportunities for some fun images. In windy conditions it crashes up onto the sea stacks. In calmer conditions it would be a nice spot to practice some long exposure photography. I still haven't visited in ideal conditions and my images so far have been more scouting images but there is lots of potential here. One word of caution: this beach is famous for its "Sneaker Waves" which can reach up remarkably high as some people discovered in this video here. Please be extremely careful here, even if it looks peaceful enough as the currents can catch you out quickly. I personal love this beach more for the amazing rock formations that surround it. Some of the fractured lava here makes for some interesting detailed landscape images. In short, there are a huge variety of image taking opportunities here and if you are able to, I highly recommend spending some quality time exploring the area. It's also not dissimilar to my next location but tends to be much quieter. Ok, this one makes it on the list as it's still a fantastic location despite the exponential increase in visitors it is receiving. Located off Route 1 on the south coast, after a short drive on Route 215, is the black sand beach of Reynisfjara. There is a large car park and cafe at the entrance. Keep in mind that this place has become VERY popular. If you want to visit when there are less people I recommend the early morning/late evening when the visiting day trippers from Reykjavik haven't arrived/have left. In the summer head over in the night when it is still light anyway. Alternatively I have enjoyed it here in poor weather which offer some moody image opportunities and have the added bonus of keeping the crowds away! On the beach to your left are the basalt columns which make for some interesting shapes and tower above. If you walk around the corner on the left you will see the famous sea stacks, said to be the frozen stone remains of trolls who were pulling a ship to shore but were caught by the rising sun. There are some lovely seascape image opportunities here. Long exposures would work particularly well on a calmer day as they may have the added bonus of removing the people who would be walking in and out of frame. On dramatic weather days the seas crashes up here and allows for some spectacular images. There is also a cave in the cliffs with interesting rock patterns and formations. As with Djúpalónsandur, this beach is dangerous because of its "Sneaker Waves." In fact, people have died here having been dragged out to sea. Every time I visit I still see people playing with the incoming waves though without realising that just off the beach is a sharp drop which is where they could be dragged if one of the larger sneakers caught them. In high tide and windy conditions, don't even venture left around the cliffs as the sea can come right up to them. The images I have shared from here are all iPhone images from my last trip in 2017. The weather was changeable to say the least. Some of the waves were spectacular and the view down towards Dyrhóley was spooky. Incidentally, Dyrhóley is another place to visit with great views on offer from the lighthouse on top of the cliffs. Reynisfjara is another great location to explore and you can find areas away from the crowds here still. In fact I would make a particular recommendation here. If you plan to visit this area and take in Dyrhóley, Reynisfjara and the aircraft wreck, as many typically do, I say skip the wreck. The car park is miles away from it, the walk is not very nice, it's really busy and the plane doesn't look nearly as good as it once did. I think people have stolen a lot of the parts! I would spend more time at the other locations instead. To get some different views of the sea stacks it's also worth visiting the beach on the other side, just through Vík. Fewer people visit here for some reason but it offers some nice images. This is less of a single location but instead a drive I would highly recommend which offers up some lovely opportunities to see the coast in the north of Iceland. I have only driven it once but I'm desperate to get back up there with my big camera and try to capture some of the coastline. Húsavík is a pretty fishing town in the far north of Iceland. You reach it from Akureyri following Route 1 towards Mývatn before taking Route 85 north towards the coast. There is a great fish restaurant in Húsavík called Fjaran where we had a lovely lunch overlooking the picturesque harbour. Here there opportunities to photograph some of the pretty fishing and tour boats and colourful buildings in the town. This would also be a good place to take in a whale sight seeing tour. I believe that these are only possible in the summer but this may have changed. This could provide an interesting opportunity for some unique nature photography and the advantage with this location over others is that it receives less traffic. You are therefore likely to get onto a quieter tour. From Húsavík the road hugs the coast passing numerous farms and crossing small streams and rivers. On a clear day it really is spectacular and the views out to sea are special. There are a lot of places to stop along the way to photograph the coast. I imagine in the summer during the sunny nights, this would be a great location to capture the midnight sun just dipping below the horizon - you only get full 24 hour sunlight in Iceland from the island of Grimsey which is in the Arctic Circle to the north of here. The leisurely drive probably takes about 45 minutes in total but longer if you are stopping constantly as we were. The images for this part of the trip are iPhone images from my honeymoon. It wasn't a photography trip for me so these are just some snaps. At Hringsbjarg there is a small car park which sits up on the top of some very high cliffs. On a clear day you can see right across the estuary area and over to the far side of the bay. There are a lot of birds here so bring your long lens. This would be another great location to capture the midnight sun and the coastline. On a wild day I image the view may not be as spectacular although it still may be possible to capture some waves crashing into shore. If you are up this far north already I can recommend camping in Ásbyrgi which has good facilities and is very quiet. Plus the Ásbyrgi canyon is spectacular and empty. I want to revisit there this year and if I do will write up a separate post on this special location. There are many more places to visit along the coast of Iceland including the grand east fjords, the west fjords and also the islands. I'm sure I will add to my posts in the future with other blogs about some of them but for now, this wraps up some of my favourite spots around the country for seascape photography. Iceland sits alone in the North Atlantic Ocean. It's a wild ocean up here providing photographers with opportunities to capture the raw power of the sea as it pounds against the island. You won't find crystal clear tropical waters here! I have spent considerable time in various locations, and in somewhat extreme conditions at times, trying to capture some of that power in my images. There are a few locations I would recommend visiting if you would like to try and photograph the sea here. Located on the Reykjanes peninsula, Brimketill is a perfect location to capture waves crashing against cliffs, to see birds surfing the air currents above the water and generally feel the raw power of the sea. To reach Brimketill you first travel out to Grindavík along Route 43. Just before Grindavík you take a right turn onto Route 425 and follow the road for about 10 minutes until you see a small sign saying "Brimketill." Incidentally, on the way there are a few places you can stop to see the ocean also. There is a graveyard close to the sea where the waves can be impressive on a stormy day. At Brimketill once you have parked and if the weather is windy you may see the waves crashing up and over the cliff tops above the pathway. In my experience, if this is the case, be a bit careful when you start going up the steps and onto the walkway as the waves can crash up and over here from the right hand side making for a quite scary experience. Generally speaking, this only happens if the wind is directly from the South or South West. It's an impressive but unnerving thing to see! I have been up here in extremely stormy conditions and I will admit that it is frightening! The walkway extends out onto the clifftop. On a still day there are a couple of tide pools visible. Please don't do as some have and go for a dip! The currents and sea here are extremely unpredictable. On a windy or stormy day you can watch the waves come towards you and break up into huge plumes crashing over the cliffs around you. The noise and energy here is unbelievable! About 5 minutes further along the road from Brimketill is another great location for sea photography, Valahnúkamöl. Accessed off Route 425 by following the signs for Reykjanesviti lighthouse, this a safe and fun place to capture a range of seascapes. Follow the road towards the light house (which is Iceland's oldest) going up and over the small hill. As you come down you will see the coast and car park area in front of you along with impressive sea stacks. Once parked you can spend time walking around the area here to photograph the large sea stack off the coast (see image of me at the start of the article) or further stacks just off to the left. In the distance is the island of Eldey where the last Great Auk was killed. There is a monument of one looking out to sea here which I always find quite poignant. It is possible to sometimes walk up the cliffs to the left but the municipality will close these off if it is a) not safe or b) they're trying to allow the area to recover from damage. Therefore it is closed, please don't try and get up anyway, something I see all too often here. This is a great location to photograph sunrise, particularly in the winter when you don't have to get here so early! Londrangur is located on the Snaefellsnes peninsular in the west of Iceland. Famous for its towering basalt cliffs, which are up to 75m high, there are some great opportunities to photograph dramatic images of the sea here. The cliffs are ancient volcanic plugs which have been eroded by the sea. Farmers do not use the area as the two cliffs are believed to be an Elf Church and an Elf Library. There is certainly something mysterious about the place. You can reach Londrangur off Route 574 on the south coast of the peninsula. You cannot really miss them and there is a clearly marked car park on the left. The walkway here leads up onto the cliffs and a number of viewing points where you can photograph the coastline in both directions. The view, on a clear day, of Snæfellsjökull behind you is nothing short of spectacular also. That's it for Part 1. In Part 2 I will cover another location in Snæfellsnes, Djúpalónssandur, as well as Reynisfjara beach in the south. I'll also mentioned a rarely visited coastline in the north of Iceland. If you didn't sign up via the pop up, don't worry, you still can here!